The bathroom of today is one of the rooms that is given the highest priority. The main focus is directed towards form, function and quality. 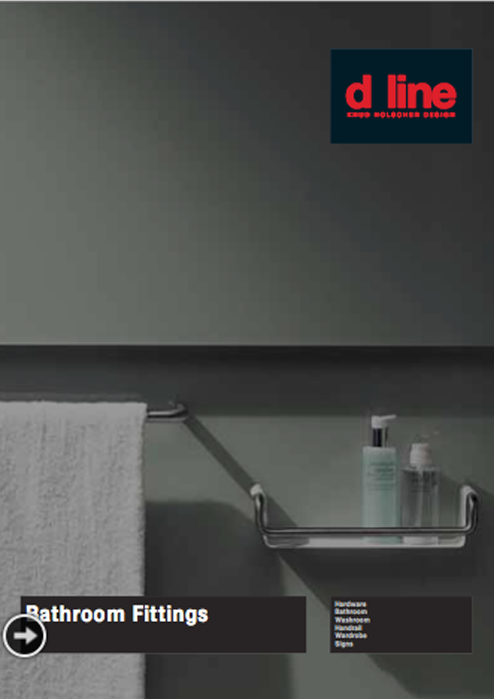 d line bathroom accessories are all based on these qualities; impeccable design solutions, intrinsic functionalism and installation techniques developed through years of invaluable experience. Hygiene and maintenance are already prevalent concerns in the products design phase. d line is able to supply bathroom accessories for every need – wheter it is for at private home or a larger commercial building. As with all d line products they are produced in AISI 316 steel for a long life circle and easy maintenance which makes the products suitable for use in very humid environments. d line also has a range of products to suit the people with special needs. Beautiful and elegant lines characterizes the d line barrier free range. Suitable also for high-traffic areas due to the strong yet flexible design. A complete new range is under development and will be introduced to the marked in a short time. Today the range comprises grab rails for the toilet, toilet roll holder and grab bars for the wall – both with and without roses. In the new range we will introduce a complete series of grab rails, seat for the shower, a rail system for the walls etc.